A few days ago together with a group of bloggers and storytellers we drove over 300 kilometers to Lira District in Northern Uganda to document stories of war victims. As concerned citizens of Uganda we are aware that even though the war in Northern Uganda ended over six years ago, some of the effects of Kony’s brutality will never go away. Evelyn Akullo and her mother Mildred Omara survived narrowly when the rebels set their house (grass thatched hut) ablaze about 6 years ago. Even after numerous medical surgeries the duo sustains big scars from the severe burns. As we excavate more stories of the victims of the war we learn that Kony remains the least on the agenda’s of the victims. Evelyn is now back in school and her biggest worry is whether she will ever achieve her dream. Her dream is to become an engineer. She believes that her determination can get her there but she worries about the school fees. Her mother’s right hand and part of the neck remains paralyzed which makes it hard to bank on her for school fees. 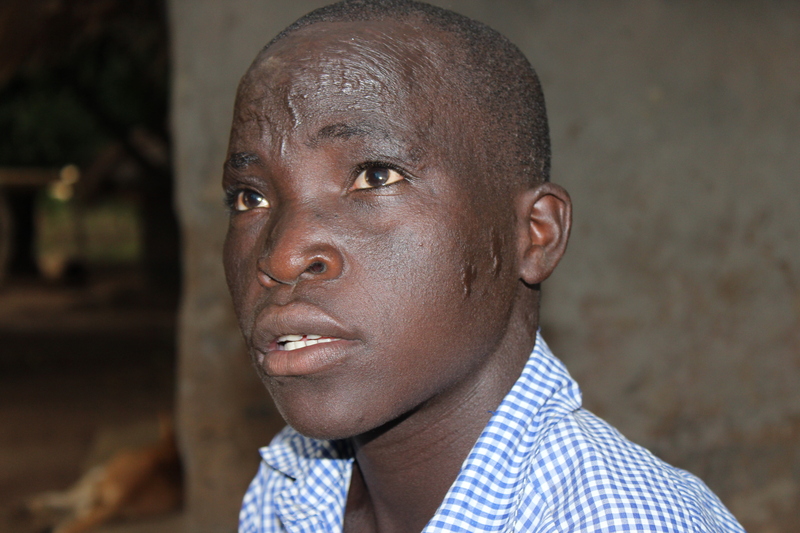 Bosco Okema is a former child soldier – he regrets the things he was forced to do while in captivity. He escaped from captivity and he is one of the many returnees who got a chance to go back to school and later get a job. He is now the Administrator at Action for Community Development – Uganda. This non-profit organisation supports sustainable agriculture through giving seeds (ground nuts, soya beans extra) to war victims in different parts of Northern Uganda. Morris Okello is a peasant farmer, his wife was 50 years old when the rebel abducted her. She was later voluntarily released from captivity and she returned home. Morris’ family is one of the 50 beneficiaries from Action for Community Development’s program. Morris’ farm is his sole source of livelihood and this has helped him to support his family and send some of his children back to school. “What he did was actually very very bad, I have heard where they would even roast people in pots in some other adjacent villages there. capturing small children….. those were very very bad thing” Morris laments. He says that he doesn’t see capturing Kony as a priority because Kony is not in Northern Uganda at the moment. He recommends more sustainable ways of supporting the people of Northern Uganda. 12 days: that’s how long it took the whole of Government of Uganda to release an official statement on the controversial Kony2012 video. Again what this reminds me is that Social Media is for citizens – if you have been following the story, you have probably noticed that Uganda on the web criticized the video the moment it as launched. Today the government of Uganda released an official statement on the #Kony2012 campaign. The statement was delivered by the Minister of Information – Ms. Mary Karooro Okurut. At the same time a women’s movement group today described the video as demeaning to the efforts of the Ugandan Civil society and thousands of both local organisations which have played a key role in championing peace restoration efforts in North and North Eastern Uganda. “If there wasn’t civil society in this country, people in North and North Eastern Uganda would be no more. But we held the whole mantle as the civil society, we went door to door; that is our approach of advocacy. But theirs which is your know, those pla-cards campaigns; that’s what it means in the west.” says Ruth Acheng, Director – Isis, WICCE. Disclaimer: Even though I write from an informed perspective, my comments do not represent the voices of millions of survivors or victims of the war in Northern Uganda and Central Africa at large. I have seen some people on twitter being rude about my opinions on KONY2012. If you are interested – READ below else hold your peace forever! Again, dont ask me why I havent stopped Kony or whether I intend to stop him and how. I am a civilian and I have my own ways of promoting social change, peace and reconciliation in Uganda – through promoting and sharing skills on use of technology to enhance access information and advocating for human right. That I have done! I can’t certainly remember the first time I saw Kony’s photo in Uganda’s newspaper. What I certainly remember is that his picture has been stuck in my mind since then. I cant forget his famous picture with dreadlocks, wearing the army uniform – he sure looked “bad”. Since then every other day I learnt that Kony was and is a bad guy. There were more horrible stories of his crimes against humanity as I grew up in the newspapers, on radio and television. Stories such as: how Kony abducted children and turned them into child soldiers, how he rapped women, burnt them alive or even ripped off their lips! Of course there were some controversial stories where Kony denied some of the reported crimes claiming that they were committed by the Uganda People’s Defense Force to tarnish his image. This was very hard to believe because if Kony had an image, he had tarnished it himself. Now that you are reading this you have probably already seen the KONY2012 video or heard about it somewhere. The KONY2012 campaign video which started going viral just 2days ago has been viewed over 32 million YouTube (also available on Vimeo). The topics #StopKony and #KONY2012 are trending on twitter. The Campaign is aimed at making Joseph Kony famous, not to celebrate him, but to raise support for his capture – according to Invisible Children’s co-founder Jason Russell. If you have seen the video and you think that KONY2012 is a brilliant campaign, you should read on. Kony fled Uganda with the LRA in 2008 following Operation Lightening Thunder in which the US provided financial support and equipment to Uganda People’s Defense Force (UPDF). Kony is expected to be somewhere in Central Africa jungle – probably Congo or South Sudan. I despise Joseph Kony and the LRA but I have no confidence in Invisible Children. Rebuilding Northern Uganda should be through promoting peace and reconciliation NOT through endorsing war – (I wonder whether you have seen the picture of Jason Russell (of Invisible Children) posing with weapons and SPLA –http://bit.ly/9R8bDd). Human Rights Activists don’t show off with guns like this – I know this because I am an activist myself! A picture like this actually declares war. There is a difference between an armed civilian or “human rights activist” and a soldier. Kony fled Uganda because of the pressure from Uganda People’s Defense Forces, this is evidence that Uganda has made some remarkable progress in fighting the LRA. Why is Invisible Children not pressuring the Uganda Government to collaborate with regional forces in Central Africa – South Sudan and Congo to capture Kony? This is a gap that this campaign leaves uncovered. Such a gap continues to create an impression that Africa cannot bring the desired change without western support. The approach this campaign takes is aimed at deriving support from the United States and other western countries to intervene. It’s about time that the whole world realised that Africa appreciates the support (foreign aid and donations) but we – Africans want to be more involved in solving our own problems. Over the years Africans have tried to prove to the world that we can contribute sustainable solutions not just to Africa’s problems but also to some of the world’s biggest challenges. The problem is that, often Africa’s opinions are disregarded. I must acknowledge that it’s partly an African problem – that some lazy Africans like to be provided for – or spoon-fed. In the video Invisible Children claims that they pressured the US government to intervene. “After 8 years of work, the government finally heard us, and in october of 2011 100 American advisers were sent in to Central Africa to assist the Ugandan Army in arresting Kony and Stopping the LRA. It was the first time in History that the United Stated took that kind of action because the People demanded it. Not for self defense but because it was right.” Says Jason Russell. This is not necessarily true because as a Ugandan I know that the United States has provided a lot of financial support to the Uganda government to fight Kony since 2008’s Operation Lightening Thunder. This is one example of the many flaws in the video. And I must say that KONY2012 is a misrepresentation of the voices of Ugandans and Central Africans who have been victims of this war. The message this campaign brings to me is based on mostly events which happened in Northern Uganda in 2003 – since Joseph Kony and the Lord’s Resistance Army (LRA) fled Uganda, the strategy of this “war” must change. People of Northern Uganda are in the process of rebuilding their communities based on peace and reconciliation. It is evident that people are already settling back in their abandoned homes. “We will fight war” “We will stop at nothing” – as stated by the action group in the video. The issue is messages or slogans like this are very provocative. Daring Kony in a mocking way like this could cause more pain to the people in Central Africa. Such statements could either make Kony weaker or stronger – the later is more likely to happen. I wonder whether Jason thought through the consequences of using such words before he used them! I want Kony captured but not through use of provocative statements which could cause more harm than good! Just like Invisible Children many non-profit organizations continue to market their work in the name of “helping Africans” the only difference is that, some campaigns collapse even before they start. People in America, UK and other countries spend more time paying attention to events in their own little bubbles that they know so little about the world. When such people encounter a campaign like #KONY2012 they will think that it’s actually going to change the world in a snap. If you are seeking to solve a problem outside your own country involve the people who are being affected/ local people. The magnitude of some problems is much bigger than you would anticipate and some of your approaches will not necessarily work. Like the saying goes “if you don’t speak for yourself, someone will speak for you”. This is exactly what Jason Russell is doing – speaking for a bunch of “voiceless Ugandans”. But even as a storyteller I will tell you that there is a multiplicity of stories. And no one can ever tell my story for me! Foreign aid and support has greatly contributed to our economies but has also made corruption rampant in our governments because of lack of transparency and accountability. Our economies have now grown to be sustainable and it’s about time we quenched the “begging syndrome”. Be careful when you deal with the international media and other international organizations they can take away your dignity in the name of “social good”. From my travels I have had several encounters where people ask me about Idi Amin. Branding Uganda based on Idi Amin’s actions and Kony’s atrocities is unacceptable – this doesn’t make our international image, it makes it worse! Actually there is more to Uganda than that. There is a part of Uganda’s history which is PAST and that doesn’t determine who we are now. The bottom line is the people in Northern Uganda have seen enough weapons, wars and been oppressed enough. They just want to live a new (normal) life – without war. Plus, the child soldiers are not total strangers; they are relatives of the survivors or victims – brothers, sisters, sons, daughters, nieces, nephews of the same oppressed people. The children were used and now, they are caught up in a war which was never theirs. I would really appreciate this campaign if Invisible Children really worked with people in (Northern) Uganda and the regional governments to bring this desired change as opposed to mobilising people who technically have no influence in this region. I have been to different parts of Northern Uganda where Kony’s army committed most of these crimes and I have talked to people. Even though the memories of this terror is still fresh in their minds, they are ready to start a new life and indeed this is already happening. Now we all know that NGOs need donations to remain in “business” but then again what happened to ethics? From my point of view, Invisible Children is using the story of KONY to solicit more money from their supporters. And this is NOT okay because it is misrepresentation of the people of Uganda who endured many years of pain and now settling back in their homes.